The natural resources in the world have been consumed in an amazing speed after the Industry revolution. The development of industrial oil was about 100 years ago, as to the stock and the exploitation of oil now; it would be probably used up in 40 years. Super textile as a small-and-medium-size enterprise, lack of human and material resources, we are eager to think about what we can do for the Earth. The PET bottle is the oil floating to the surface on the ground, if we can make good use of it; there will be chance to extend the oil duration in the world. Our efforts are to be sure to earn more time to find new energy alternatives to the oil for our generation in the future. Therefore, Super Textile had been devoting to the development and research of the recycled PET fabric. It can be said it takes our effort one decade to cast a sword. Our effort on the pet bottle recycling has been approved; we are honored to obtain the 1st TUV Rheinland RECYCLED SYSTEM/MATERIAL CERTIFICATION in the world in July 2010. Our endeavor also gains the approval of the Executive Yuan's National Sustainable Awards on 7th Dec. 2010. Another honor is the Environmental Hero Award to be awarded by <GLOBAL VIEWS MONTHLY> on 8th Dec., 2010. 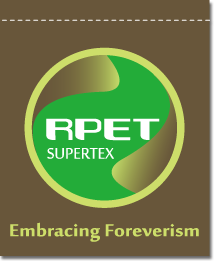 Super Textile with the brand name of Supertex RPET will provide more in-depth and wide range of applications and services.